The suspension system of your car consists of the shocks and struts. It is particularly important to maintain shocks and struts in Arizona because most cars are front wheel drive which means all of the vehicle’s steering and control comes from the front suspension system. Discount Brake Tune and Lube is an authorized NAPA AutoCare Center and will assess your suspension system by testing the shocks and struts. A malfunctioning suspension system can cause a number of problems for your vehicle. In addition, problems in this area could lead to a loss of control of the vehicle – which could cause devastating injury and damage. At Napa Auto Care Center and Discount Brake Tune N’ Lube, our Phoenix certified mechanics have what it takes to check out your car suspension problems, inspect and repair the shocks and struts of your vehicle. If you are experiencing any of these symptoms, it may be time to make an appointment with the mechanics at Discount Brake Tune and Lube. 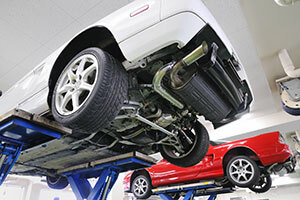 We offer Phoenix brake repair and suspension services to keep your vehicle running smoothly. For help with your suspension system, contact our Phoenix auto shop at (602) 667-3400, or call our Casa Grande location at (520) 426-1500.